Record Name Bainbridge, Semerdale. 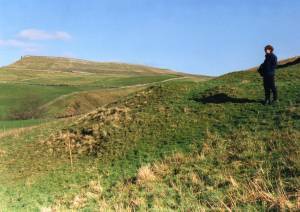 Pasture south of High Force Farm.Large burnt Mound. Record Description One definite and one possible burnt mound at spring line. 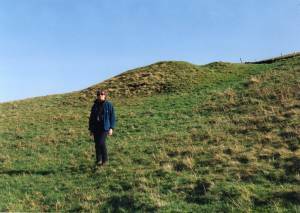 The recorded definite mound is very large and is located at a spring rise on steep sloping wet pasture. 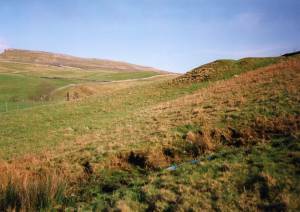 This prominent mound is clearly visible from the road near High Force Farm although there id no public access. It has a flat top with a raised rim. For a sheltering sauna structure? This burnt mound is a very large example and is one of at least 10 of these enigmatic sites located on high ground overlooking Semerwater. 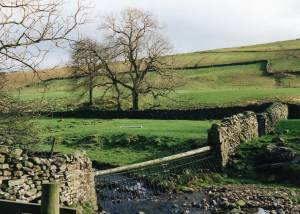 For details of the prehistoric sites centred on Semerwater, see Laurie 2003. 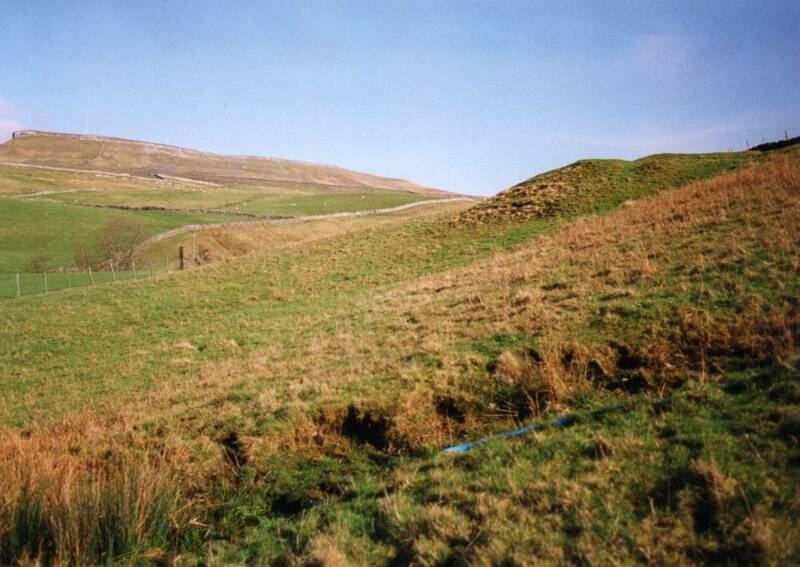 The second (possible), unrecorded, burnt mound is located below the modern dry stone wall corner on the first photo below, at the same level as the recorded mound. 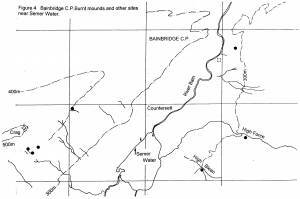 For details of the burnt mounds and other prehistoric sites around Semerwater, see the attached Location Map and also Laurie 2003, 2004. Additional Notes *Indicative dimensions. Size: Small <6m, Medium 6m-9m, Large 10m-15m, Extra large >15m. Height: Low <0.5m, Average 0.5-1.0m, High >1.0m. Image 1 Description Bainbridge.High Force Farm. Location of the two sites. The definite burnt mound is on the steep open slope to the right of the ash tree.. Image 2 Description Bainbridge.High Force Farm. Very large burnt mound. 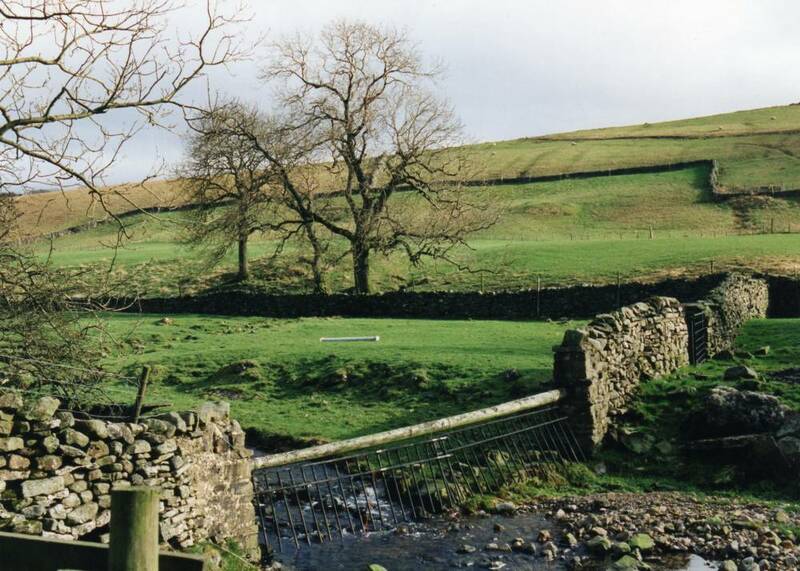 Image 3 Description Bainbridge.High Force Farm. Very large burnt mound. Image 4 Description Bainbridge.High Force Farm. Very large burnt mound. Image 5 Description Semerdale. 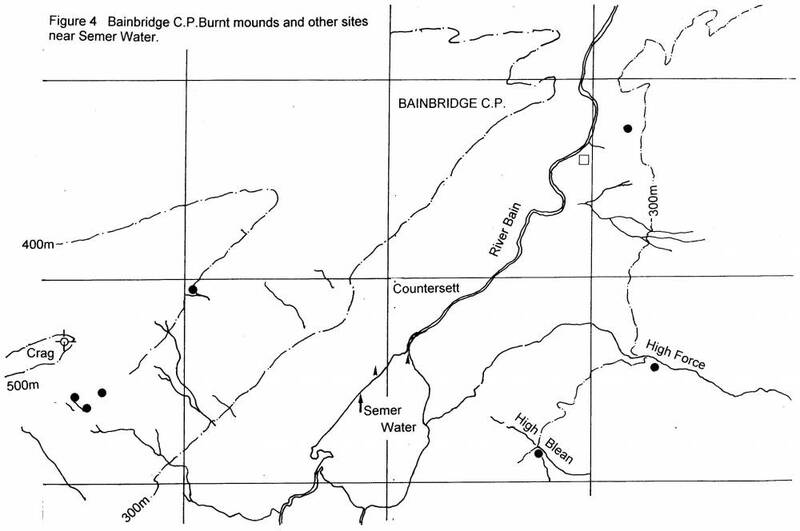 Location of burnt mounds, filled dots, and other sites and lithic finds.